The StarTrac Pro elliptical trainer is the best model in its price range from the company that maintains the top spot among commercial fitness machine manufacturers. The StarTrac Pro is a near perfect machine, even sharing the same frame and design as its more expensive sibling, the Star Trac Elite. Both elliptical trainers also share the same whisper quiet and stable design, and have an incredibly smooth motion that will delight any casual walker or serious marathon runner. The StarTrac Pro elliptical trainer gets high marks from experts for design, quality, features, performance, durability and warranties. It’s a heavy-duty model weighing 450 pounds that can take the punishment of a heavy user day after day. Fitness trainers praise the StarTrac Pro’s front-wheel drive which adds to the elliptical’s stability. It has the unique design of the user being able to step up to it from the back or sides without having to step over the footplates to mount it. Just a note: home users of the StarTrac Pro need to be aware that the unit is quite heavy and since it comes nearly fully assembled, you should take pity on the installers if you expect them to haul it up stairs or through tight doorways. 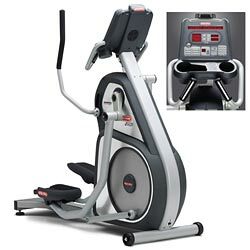 You’re obviously wanting to research the Star Trac elliptical reviews online to learn about the problems, the pros, the cons, the negatives, all the warning bells, all that will inform you if the StarTrac Pro elliptical trainer is worth your hard earned money or not. Of all the ellipticals we’ve reviewed, this is one we’ve been unable to dig up any dirt on. The StarTrac Pro is a fabulous machine. Users love this elliptical trainer, techs don’t get called a lot to repair it, and it’s just about the best dang fitness investment you’ll ever make. Buy it.